Barbara L. Jouette, Attorney, P.C. serves to protect and represent the best interests of clients and their families. We are proud of our firm’s reputation for providing personalized and compassionate counsel and representation and we will serve as your trusted advisor when it matters most. We take pride in our professional and high-quality legal services provided in an office environment where you feel comfortable and confident that your requests are understood and addressed. Barbara L. Jouette represents people throughout Collin, Denton and Dallas counties in matters regarding divorce, child custody and family law, and wills, estates and probate. We adhere to the highest level of integrity and always maintain your best interest as our highest priority. Our dedication to quality, understanding of the law, trust, and respect comprise the foundation of our long-standing relationships with clients. 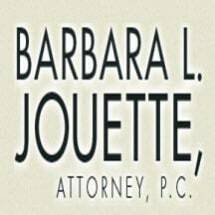 At Barbara L. Jouette, Attorney, P.C., we want what is best for you and your family. Contact us today to see how we can help.